Thanksgiving is about more than stuffing turkeys and full bellies after a good meal. The holiday is really about recognizing our blessings and being thankful for the wonderful things we have in life. For companies looking to find the best talent in order to grow and stay competitive in this tough marketplace, great candidates are truly a reason to be thankful. The infographic below, compiled by Spark Hire, an online video resume and interviewing platform, looks at the different types of candidates making employers thankful this Thanksgiving season. From the seasoned Baby Boomer to the social media-savvy Millennials, there are plenty of talented candidates your company should be thankful to bring to the table. With only 17 percent of employers finding candidates with the right skills for their open positions, you should give thanks when great candidates come your way. 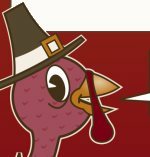 This infographic is a Thanksgiving reminder hiring managers and recruiters can keep in mind before cutting the turkey and doling out the stuffing. Leading technology and service companies often contribute to Recruiter.com, demonstrating their commitment to thought leadership in the field of recruiting, employment, and hiring. Companies interested in contributing to Recruiter.com can use the main Contact form on site.